This is the second in a series of articles on the topic of Your Personal Leadership Journey. 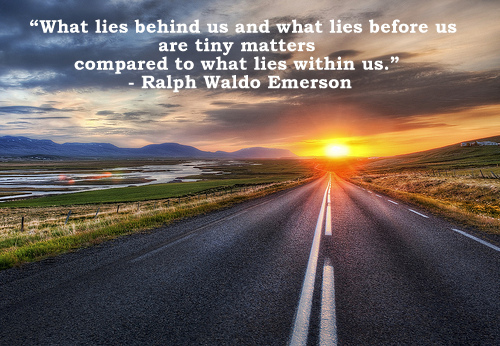 As a leader, you will be faced with many choices that you will make along your journey. You will find that many of these choices will be easy to make, but there will be times when you have to make some difficult decisions. You will discover by having a personal mission statement as your foundation, choices and decisions will be a little less difficult. This is because you have taken the time to recognize your personal values, fundamental beliefs, and principles that are important to you. 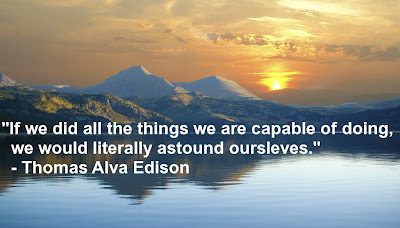 And, you have integrated those into your personal mission statement. By taking the time to reflect and become self-aware of what is important to you, you begin to find your true voice. In their book, Learning Leadership, Kouzes, and Posner describe the process of finding your true voice as a merging of lessons you have learned from looking out and looking in. Looking out is defined as what you learn and acquire from the experiences of others through reading, workshops, training programs, etc. Looking in is awakening to who you are on the inside and determining what is of utmost importance to you. By merging what you have learned from others (looking out) and who you are (looking in), you come to a “turning point in your development as a leader.” You begin to speak with your words and act in agreement with your way of doing things – your style. Kouzes and Posner state, “Authentic leadership cannot come from the outside in. It comes from the inside out." Being an authentic leader is being true to who you are and what you believe based upon your synthesizing what you have learned from others and through your personal experiences. “You cannot lead out of someone else’s experience. You can only lead out of your own.” Listen to your heart and be true to your values. As you invest time to develop more of an understanding of yourself, it is important to realize that as other individuals go through this process, they may see things differently than you do. You are who you are because of your genetics and your experiences. 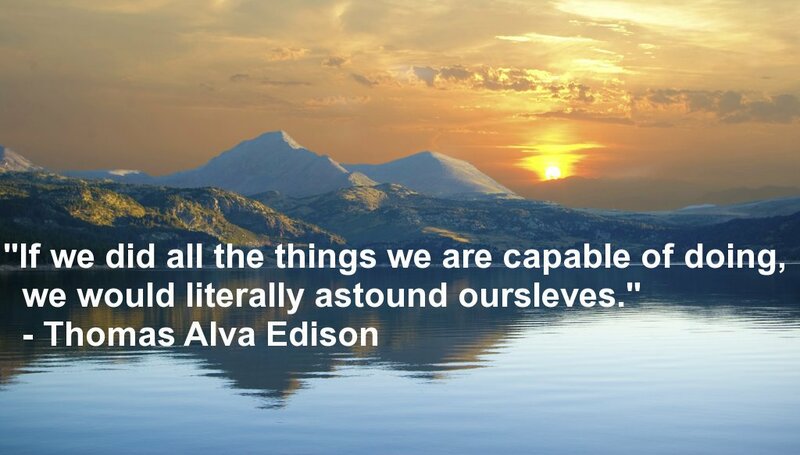 Everything you have experienced up to this point in your life has contributed to the way that you perceive the world and how you react to it. This applies to every person. Everyone perceives aspects of the world differently. Stephen R. Covey describes this perceiving process in his book, The 7 Habits of Highly Effective People, as our paradigm – a theory or explanation of things. He further explains that we interpret everything we experience through this paradigm. “We simply assume that the way we see things is the way they really are or the way they should be.” This leads to the attitudes we have and the behaviors we exhibit. In essence, “The way we see things is the source of the way we think and the way we act." We all have different perspectives. It does not necessarily mean one way is right and another way is wrong. The point is each of us perceives things differently, which may result in our coming to different conclusions and reacting in various ways. Acquiring knowledge about your personality type can help you to understand why you take the actions you do and why you reach conclusions you do. It will help you to be more aware of why others do things differently and how you may be able to work with them in more efficient ways. This knowledge will aid you in appreciating differences in other people. The MBTI helps an individual understand his/her personality preferences. 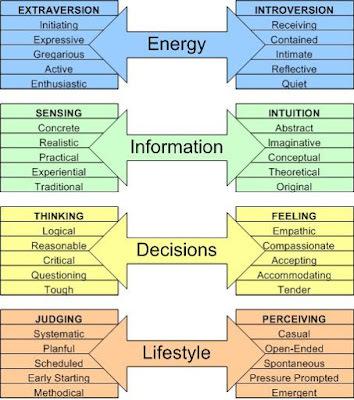 In the chart below, the middle column lists the four dichotomies with the left and right columns listing the eight areas of comfort, or preferences for an individual. Each of these eight areas has a letter assigned. For example, Extraversion is the letter E and Introversion is the letter I. Once the person chooses his/her preference in each category, their personality type is represented by a combination of the codes, for example, ESFP would be a combination of Extraversion, Sensing, Feeling and Perceiving.The MBTI has a description for each of the 16 personality types to help the individual understand more about his/her personality preferences. Having an awareness of personality types as part of your foundation on your leadership journey should help you to understand why there are different leadership styles. A review of articles, books, and research show that Kurt Lewin’s research in 1939 found three major leadership styles. Recent information suggests there may be as many as eight different leadership styles. 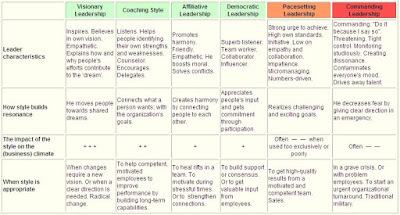 The leadership styles may have different names, depending on the article or research you read, but each has characteristics which can be easily observed. There are those who feel most comfortable making all the decisions and telling everyone what to do and how to do it. They are more autocratic or authoritarian. They typically do not want other’s advice and feel they have more knowledge and skills than their staff members. At the other end of the spectrum, you have those who feel more comfortable allowing staff make decisions but who still maintain responsibility for those decisions. This style is considered to be more laissez-faire. It is often used when the individual has a lot of trust and confidence in the staff, and he/she will delegate because the staff has the needed knowledge and skills. Of course, there are other leadership styles on the continuum between these two extremes. Other names you may hear used include transactional, democratic/participative, diplomat, and idealist, just to name a few. Each of these styles has characteristics and ways of carrying out actions in different situations. It is important to keep in mind that there is not necessarily one style that is better than another. Each one is different and depends on the individual’s personality, comfort level, and the situation that is being dealt with at a particular time. 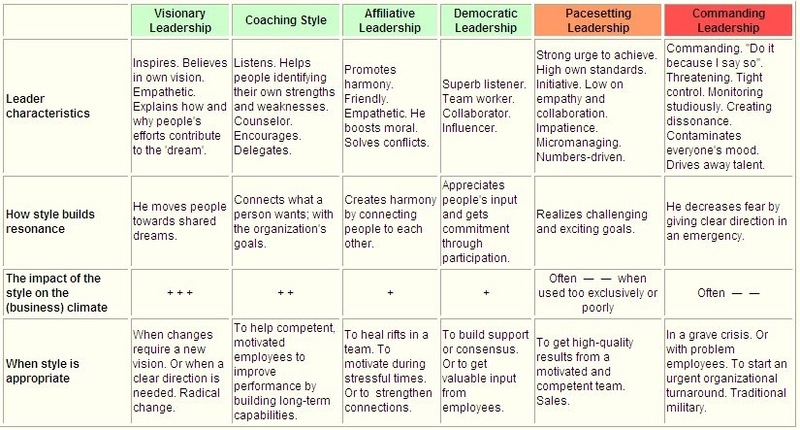 In looking at some of the different leadership styles, the chart below by Daniel Goleman, author of Emotional Intelligence, and Primal Leadership provides great information about some different leadership styles. Goleman provides some insight by describing leader characteristics, resonance, impact (the degree of positive or negative), and when the style is appropriate. Click on the chart to expand for readability. Each of us has a leadership style or a combination of styles we feel most comfortable using. However, it is important to understand that you may use more than one leadership style depending on the circumstances of a situation. As the chart above shows, there are times when one leadership style is more appropriate than others. Being able to adopt the appropriate leadership style to different situations can produce powerful results. Although you may not feel comfortable or as confident in using some of the other leadership styles, it is helpful to know you can develop yourself in these leadership styles with practice. Learning to use different leadership styles in the appropriate situations is all part of your personal leadership journey.